The château du Haut-Kœnigsbourg is located at Orschwiller, Alsace, France, in the Vosges mountains just west of Sélestat. 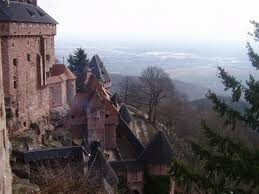 The castle is nestled at a strategic location on a high hill overlooking the Alsatian plain; as a result it was used by successive powers from the Middle Ages until the Thirty Years' War when it was abandoned. 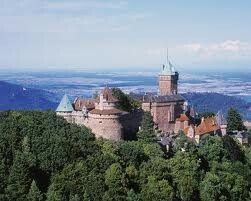 In 1900 it was restored under the direction of Emperor Wilhelm II. The roads around this particular area are mostly on a bit of a plateau without much elevation change.